Options: Wall-mount or Rack-mount; Available in 50 ohm. 4 independently-controlled amplifiers in a single case. Options: Wall-mount or Rack-mount; Available in 50ohm. + 15 dBm downlink power. Color splash screen for local visibility on all bands. 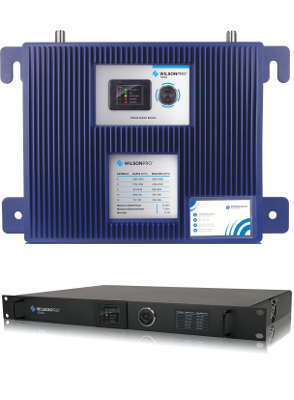 The WilsonPro 1000 is Wilson's flagship cellular amplifier system providing significantly enhanced voice and data coverage, including 4G LTE inside commercial buildings where cell signals may not otherwise penetrate. The result for your clients are no more dropped calls or lost connections, faster uploads/downloads and a reliable, up to 32x stronger signal. 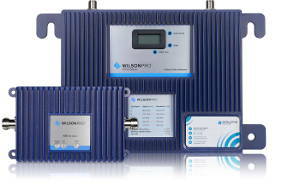 The WilsonPro 1000 delivers maximum FCC-allowed downlink power to provide the largest possible indoor signal coverage. The WilsonPro 1000 also includes Wilson Electronics’ state-of-the-art XDR (Extra Dynamic Range) technology that prevents signal overload conditions which can, in accordance with FCC regulations, force a booster to reduce power or even shut down. Options: Wall-mount; Available in 50ohm or 75 ohm. Features: Self-optimizing with built-in signal meter for easy tower locating. + 12 dBm downlink power. Digital Display to view Automatic Gain Control. The WilsonPro 70 Plus Commercial Building Cellular Signal Booster provides a large building coverage area. The Pro 70 Plus is perfect for large commercial buildings and larger luxury homes. The Pro 70 Plus features the highest downlink power of any FCC certified signal booster on the market. More downlink power allows it to provide more in-building coverage than, even its closest competitor. The WilsonPro 70 covers up to 25,000 square feet (more with a very strong signal outdoors). Get more WilsonPro 70 Information. The WilsonPro 70 Commercial Building Cellular Signal Booster provides a large building coverage area. It is perfect for smaller commercial buildings and large luxury homes. The Pro 70 features the highest downlink power of any FCC certified signal booster on the market. More downlink power allows it to provide more in-building coverage than, even its closest competitor. The WilsonPro 70 covers up to 15,000 square feet (more with a very strong signal outdoors). 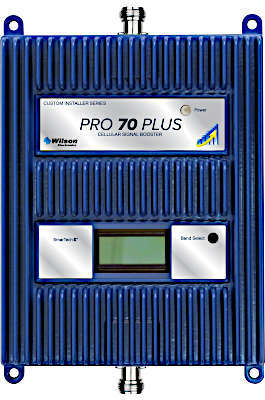 Get more WilsonPro 70 Information. Need help selecting the right commercial building cellular signal booster system for your building? Feel free to Contact Us. We would be happy to help.